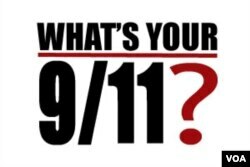 As part of VOA's What's Your 9/11? project, Sam from Iran shared this story about how the September 11th attacks influenced his plans to study in the U.S. It's just one of many stories from young people and students around the world about the news events that have shaped a generation. Add yours and join our growing community at http://whatsyour911.com. I had just came back home after taking a TOEFL test that I heard the news. I had planned for months to study in an American university. After learning about the news I told to myself they - US embassy - is not going to give me a visa even though i was sure none of those terrorists were Iranians. Yes it had a big negative impact on my education. In Tehran people held candlelight vigil in the memory of the US victims and signed a book in the Swiss embassy. We were angry at those who carried out that attack. President Khatami, a reformist denounced the attack on the US. We were angry that some arab and perhaps pakistani nationals were celebrating this yet it was Iran who was labeled the axis of evil. This is a general sense of iranians at that time, not just my personal opinion. In Dubai or Ankara where iranians go to get US visa, even after the attacks, it was still surprising for us to see non iranians are getting the student visas or other visas easier at that time. I ended up studying in the US much later which I am thankful. I think politicians in the US should always separate iranians from the people who rule over them. I am not saying every one there is against the government but there are more and more who are turning against them. So yes that event in the US had a great impact on my life, maybe the greatest till now because instead of studying engineering in the US, I studied something totally different in Iran. I am not sad that I am not an engineer but I am not happy because of the gap and the delay that happened in my university life. Join the project and share the experiences that have shaped your life on our What's Your 9/11? website, or by using the form below.